Despite Hollywood’s determination to sell its soul to China, a lingering institutional insensitivity to Asian type-casting and crude stereotypical jokes persists in the industry. Jason Biggs and his tweet about Asian drivers is a case in point. Had his racial humor targeted any other demographic group, his career would likely be on life support, but in this case, Hollywood just shrugged. Soon-to-be unemployed actor GQ Qi understands the hypocrisy only too well. 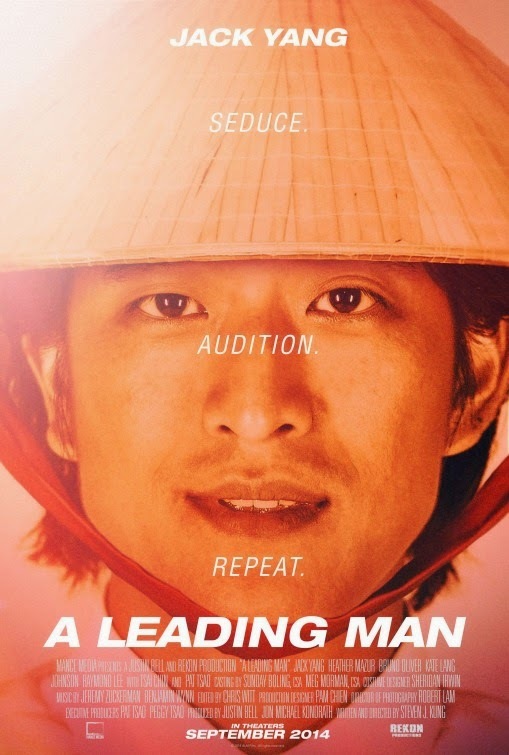 He has played the game better than most of his colleagues, but has little to show for it in writer-director Steven Kung’s A Leading Man (trailer here), which opens this Friday in select cities, following a well received festival run, including Dances With Films. Qi had to fight to get the starring role in Mitch Lebowitz’s new sitcom Pu Pu Platter, but playing the cringy, subservient exchange student makes him nauseous. Lebowitz’s overbearing demeanor and insulting condescension do not help either. After Qi inevitably snaps, his longtime agent drops him. Even his formerly supportive mother cuts him off, suggesting he finally settle for a management position in the family’s Shanghai semi-conductor family. However, he has a bold plan: he will romance up-and-coming casting director Rachel Cohen. Against her better judgment, Cohen succumbs to his charms. Unfortunately, when Lebowitz gets wind of their relationship, he fires Cohen as well. Suddenly, both Qi and Cohen are on the outs. Is their relationship real enough to withstand the financial and emotional pressures to come? If so, it will be a hard fought victory, because there is not a lot of easy sentiment or unearned feel good moments in Leading. While Kung excoriates Hollywood’s Asian stereotyping and discrimination, he clearly implies there is also a bit of karma at work in Qi’s case. Fittingly, Jack Yang really does have leading man presence as Qi, but he is not afraid play up the Machiavellian and rather unsympathetic side of his character. It is a dark, subtly calibrated performance that gives the film real integrity, even if it pushes away sympathetic viewers. Heather Mazur plays off Yang quite nicely as the smart and down-to-earth Cohen, while executive producer Pat Tsao is a force of nature as the sort of iron-willed mother that nearly anyone can well relate to, regardless of ethnicity or nationality. Hollywood takes in the shins throughout Leading, but to Kung’s credit, it never lets anyone off the hook. It might sound like a thematic analog to Robert Townsend’s Hollywood Shuffle, but Kung’s film is more thoughtful and dramatically complex. Despite the inconsistency of some supporting players, A Leading Man is worth a look, particularly for those who appreciate a caustic look at the movie business when it opens this Friday (9/12) in limited markets.